Great apps are even better when they’re on sale! We’ve selected 58 iPhone and iPad apps that are over 30% off. 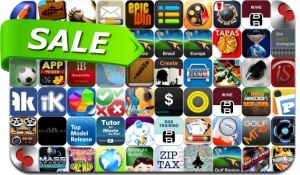 This app deal alert includes Turret Commander, Need for Speed Hot Pursuit, Mass Effect Infiltrator, NBA Jam, Dragon’s Lair 2: Time Warp, Strainer, iEleven, Over, Vintagio, Video Downloader +, FunSlides, PhotoPhrase, ScrapBook, FileApp Pro and many others.